My journey as a children's yoga teacher has revealed more of the invisible boundaries of my own rearing experience by society. It began with some anxiety around whether I would be a good teacher for the children and a steward to them. There are occasions when teaching a class is sprinkled with moments of not knowing what on earth to do. On a given day, everyone is full of excitement. On others not so much. It brings to question what really is the role of teacher and who really is teaching whom. I've seen the visible transitions of my classes as school gets more intense. There is a weariness that shows on their faces sometimes. The verbal recognition of this is expressed in words " I'm tired", " School was hard". The most obvious sign is their wanting to play. They run into the studio, cartwheeling or reaching for a hula hoop and they begin to play. Joyously so. They don't want serious Aunty Dio attempting to strengthen their backs and spines and sharing the physical benefits yoga. Bah Humbug. 100% fun and relaxation is what they are there for. Weave downward dog into a game and they are all in. Except for the time a little girl said "Hmm this sounds familiar, are we doing sun salutations in smart?" Lol twice. When did we start creating boundaries around fun. Enough fun , time to get serious were words we heard from teachers, parents, and other authority figures. The messages that turned into barriers to joy as adults that with some guilt we journey to overcome. I think it began when we felt our responsibility was to moderate the joy of life in order to be set on the proper path to adulthood. We wanted to be good adults and we modelled all that we had seen over the years. There are amazing benefits to yoga practice for children. Google will easily supply you with an adequate listing. My journey however is turning into how to weave joy into my classes, so intricately that they receive the full benefits of the practice but more importantly that their capacity for joy and fun is never diminished. It means reaching out to my own inner child and bringing her to class alongside Aunty Dio so that together we are all blessed by the gift of Yoga and the gift of Joy and make them both one and the same. "A mind free from all disturbance is Yoga'. In the pre-dawn hours of Sunday April 6th there was precious little indication that my mind would embody this Patanjali Sutra in any way, any time soon. Just two days prior, we’d said our final farewells to my cousin Clinton. Outwardly, I was fine; interacting with long-lost family, making new acquaintances, providing love and support wherever it was needed. Inside, though, those feelings of anger I expressed here were pretty raw. A 5:30am wake up call wasn’t helping either, but Patrick and I had plans to squeeze a small dose of the uncommon into our somber trip. We set out on foot from the comfy confines of the Hyatt Regency Trinidad onto to the empty early-am streets of Port-of-Spain. Our destination: the Savannah, the all-everything sprawling swath of open space nestled in the heart of the capital; Trinidad’s answer to Central Park. There, just after sunrise, we were to meet with Katherine. Captivating. Bewitching, really, with striking white hair reminiscent of Storm from X-Men and soft, caring eyes that draw you in and keep you entranced, Katherine had been among the mourners at Clinton’s funeral. Patrick met her just as she was leaving the small gathering at our aunt and uncle’s place, somehow getting in the middle of a spirited discussion, the subject of which no one seems to recall, only to emerge with an invitation to sunrise yoga on the Savannah. Now, I like yoga. At the same time, I’ve only really done it once… in Dominica… about a year ago… and even then only on a limited basis. Of course, I wasn’t going to say no to Katherine. (I imagine that with those eyes, she rarely hears the word.) As we approached the circle of women already engaged in the session, though, I almost wished I had declined. Picture us, two guys dressed almost identically – black shorts, Caribbean-blue UC shirts – Patrick hauling his hefty camera bag, both of us carving a beeline across the Savannah to their intimate, all-female circle. Awkward? Yes. For about a minute. One warm glance from Katherine and a few reassuring words of welcome later and all was good. Actually, all was great as Katherine’s easy, nurturing lilt and steady pacing progressively melted my cares away. To the east, the sun was making its warm intentions for the day known to all over the slowly awakening city, turning up the heat on our little circle while forcing those of us facing her way to close our eyes. Birds sang out all around us welcoming the day in turn as Katherine continued; each word, each movement healing just a bit more the further she went along. An hour passed in what seemed like 10 minutes. I could’ve stayed out there all day, but the job was done. Inspired, reinvigorated, content. My mind undisturbed. Yoga achieved. While chatting afterward, we learned that the day’s session was dedicated to raising awareness for autism, a cause near and dear to my heart. Blue just happens to be the official color for autism awareness, so it seems our matching UC-themed outfits further helped us to fit right in! Katherine conducts her uplifting Yoga on the Savannah sessions every first Sunday of the month beginning at 6:30am. All are welcome, so you don’t need to feel shy or awkward as I did. The group meets in the grass just opposite the Archbishop’s residence in the northwest section of the Savannah. If a Sunday isn’t in your Trinidad travel plans, you can always catch Katherine at her Yoga 4 Youth studio in Woodbrook where she offers classes catering to young first-timers and seasoned yoga enthusiasts alike. For more information, visit and “Like” the Yoga 4 Youth page on Facebook. The popularity of yoga has increased exponentially since it first saw a revival in popularity in the 1980s. While it is not associated with esoteric barefoot hippies anymore, if you're a guy you probably think that it is something for women who sit around chanting 'ohmmm' while stretching a bit - certainly not a very masculine activity. That can't be further from the truth. Yoga can be challenging, very challenging. Some of the poses require immense core strength and balance, such as Astavakrasana, or Eight Angle Pose, which is kind of like doing a push-up, but with your legs in the air and to your side and one arm in-between. Even the so-called basic poses can prove to be quite taxing, and most men I've spoken to said they were surprised at how challenging yoga actually was and that most had to be scraped off the studio floor afterwards, completely forgetting about the bendy model in lycra in front of them. If you think that the guys I spoke to were half a chromosome away from being a girl, consider that guys like 11-time surfing world champion Kelly Slater, basketball behemoth Shaquille O'Neill, Red Hot Chili Peppers rocker Flea and Hollywood tough guy Woody Harrelson all regularly practice yoga. Oh, and did I mention the entire All Blacks rugby team? From core strength, to a focus on specific muscle groups through each pose, yoga focuses on developing those essential muscles that you might have overlooked, thereby easing up the pressure on your more heavily utilised muscles and providing the important balance that yoga instructors harp on about. A strengthened core and more balanced muscle structure means that your coordination and general balance will improve, leading to better form and technique when playing sports. Another thing exercise experts are continually encouraging people to do more is stretching. It is believed that flexible joints and muscles are less likely to be prone to over-use injury. With regular practise, yoga will have you go from barely being able to touch your knees to comfortably putting your palms flat on the ground. One of the key focus areas of yoga is on the mental aspect of the practise. While a debate is raging whether yoga has religious connotations or not, the effect it has on mental strength is undeniable. The practice of yoga aims to create unity between mind, body and spirit, which in essence means a greater awareness and control over your body. Most yoga poses require a certain amount of focus, especially the balancing ones and the effect this has on activities outside of the yoga studio is quite remarkable, even at the office. We spend so much time taking care of the physical that we neglect our mental health, but in an angry and chaotic world of information overload, the mental strength gained from regular yoga practice becomes even more valuable. Ever walked into a room full of yoga teachers and suddenly felt to pull in your tummy? As you hold your breath and tense every muscle in your core, you start to wonder about the possible link between yoga and amazing abs. And you are very right! A regular yoga practice offers many benefits for your abdominals, as well as your entire core. What fitness gurus refer to as the “core” of the body comprises your abdominals and back – the part of the body providing support to the pelvis and the spine which gives us our posture and facilitates movement. Core strengthening is critical - not just to good fitness – but more importantly, the ability to move freely and breathe right. Here’s why a regular yoga practice is good news for your core. - Making Gravity work for you – Yoga strengthens your core by challenging the body to support its weight in various orientations to gravity. By doing certain standing poses such as the Half Moon and Triangle, the torso muscles, including the obliques and the transversus abdominus, contract to hold up the weight of the torso which is parallel to the floor. You get added benefit when you rotate the torso in these poses, forcing the obliques to hold up the weight of the body during the motion! - All together now – Machine exercises at the gym have their benefits but they can be quite limiting. Say you want to strengthen your biceps – the machine isolates your biceps, supports the rest of the muscles in your body and challenges the biceps to make them stronger. But by the end of the workout, you’ve strengthened the biceps in isolation and not in tandem with a group of muscles. This sort of training may be good for some things but it has also been shown to increase the risk of injury by not training different muscles to work together to perform functional tasks. Yoga offers a more functional approach to muscle strengthening by challenging various muscle groups to work together. - Too much of a good thing – Grandma always said that too much of a good thing is good for nothing, and she was certainly right about that when it comes to abdominal training. Excessive abdominal training can be counterproductive as the abdominal muscles tend to become shorter over time, resulting in back muscles that are weak and overstretched. Not only can this create a hunched over posture, it can also negatively impact one’s breathing. Yoga, on the other hand, promotes lengthening of the abdominal muscles by working the core as a whole – that is front and back. A regular yoga practice will boost your core strength; and maybe even give you those amazing abs you’ve been dreaming of! The world of appearances is created by the coming together of an infinite number of ever-changing causes and conditions. Like a rainbow that forms when the sun shines across a curtain of rain and then vanishes when any factor contributing to its formation disappears, phenomena exist in an essentially interdependent mode and have no autonomous and enduring existence. Everything is relation; nothing exists in and of itself, immune to the forces of cause and effect. Once this essential concept is understood and internalized, the erroneous perception of the world gives way to a correct understanding of the nature of things and beings: this is insight. Insight is not a mere philosophical construct; it emerges from a basic approach that allows us gradually to shed our mental blindness and the disturbing emotions it produces and hence the principal causes of our suffering. - excerpt from ‘Happiness’ by Matthieu Ricard. Every aspect of my being was stretched. I was reminded that nothing happens unless it is meant to. I can try as hard as possible but I am on a Journey. It is imperative to do my best and this is exactly why I feel so confident to leave behind my old unhappy existence and move forward now to explore new frontiers. Trekking through the Andes mountains for four days starting in brilliant sunshine, summiting Dead Woman’s Pass at 4215m in clouds, snowy patches, wearing about 5 layers under my massive poncho which functioned as a carapace protecting me from the natural, harsher climatic elements and then descending nearly 1000m in one fell swoop over rocks, steps carved into rock, rickety tree branched bridges, dirt paths meant an intensity of being in the NOW to the exclusion of whatever turmoils we left behind. Looking down valleys and peering over the clouds I imagined that connection to the Gods which so many Ancient Peoples sought. It became a trekking meditation with our guide at times just in front of me but mostly I was walking unaccompanied by fellow travellers but accompanied by some great many souls who have sought a similar path, who have connected with me on my Journey. At times though it was a matter of keeping the momentum while taking in the splendor without slipping off down a precipice or collapsing due to lack of oxygen, so remembering to breathe slowly and deeply no matter how arduous the trail became my biggest lesson. All thoughts were on the practicality of mechanics. There were times when I was surprised by the physical perils of this trek but I soon realised that as I worked out how to get my body, carapace and all through the trail, my mind was conquering my mental and emotional challenges. 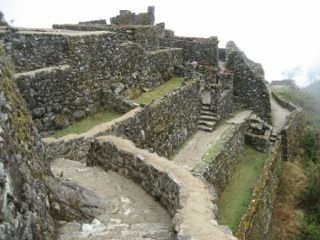 Interspersed between the trials of the trail were encounters with many Inca ruins which I explored room by room, leaning against the walls at times imagining who lived there, how the room was used, embracing the wonder and magnificence of the architecture and splendor of being in the Andes mountains. My body and soul traversed many facets of existence, wandering often so lost in my inner place of peace that the trail was now a four day meditation. 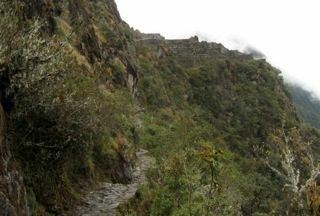 Approaching the Sun Gate just as the sun began to rise over Machu Picchu was a moment of Absolute elation. 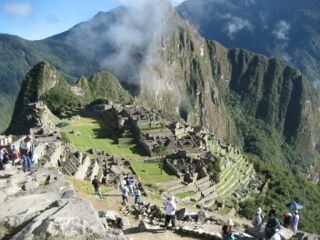 Leo our guide embraced us as we shared with him and others a magical experience. The rising SUN exposed Machu Picchu with incredible equanimity putting us into a trance as we continued our trek on the final approach to Machu Picchu. The Sun Gate revealed a hidden civilization which was hidden for so many years and although many of its treasures were lost in its discovery I do feel honored to have made the trek to Machu Picchu just as the Ancient People did so many years ago and in some essence share with all those souls who have travelled these trails, the sense of ecstasy as you pull through the Sun Gate and descend into the marvelous wonder of Machu Picchu. Before it comes into the world, a child moves in the mother’s womb. Many of these movements are reflex actions. Others, as ultra-sounds reveal, are intentional, purposeful movements, with the young fetus placing his thumb in his mouth or a twin reaching out to touch another in utero. Movement, and its role in human development, is fascinating but at no other time in history is its relevance to brain development more apparent than it is now. Recent research is showing that purposeful physical movement is critical to brain development and that by creating opportunities for our infants and children to be stimulated in the right way, we can help their brains grow and develop to their fullest potential. Every movement creates and strengthens connections within the brain and the nerve pathways in the body. These connections, known as synapses, are created through experience – repeated practice of the particular movement. Studies are showing that some of these movements in particular are vital for developing critical lifelong skills such as reading and writing as well as memory development. Infants and children should be given innumerable opportunities to move purposefully throughout the day. Parents instinctively do this with their infants, encouraging them to reach for an object or crawling along the floor with them. While the parent may think that such natural movements by the baby are all part of his physical development, they may be pleasantly surprised to learn that they are also stimulating parts of his brain that are essential to reading, problem solving and self-confidence. Yoga provides an environment of purposeful and stimulating movement for children from as young as 12 months. As the child bends, dips, kneels and stretches, his brain is creating unique movements by sending nerve impulses to his muscles. Since these movements may not be done in a sequence that the child was previously familiar with, parts of the brain are challenged to create new muscle sequences. These parts of the brain are those that are particularly used for problem solving and planning. New studies are showing that yoga may also be beneficial to children with learning delays or behavioral disorders. By stimulating the cerebellum of the brain, movements incorporated in the yoga class can help rewire some of the vital connections in the body that may be missing. Whatever the unique situation, there is little doubt that movement stimulates learning in infants and children. Yoga 4 Youth welcomes all from strong walkers to teens to its yoga classes. Visit our schedule for class times. Can Yoga Aid Weight Loss? Relaxation may sound like the antithesis of losing weight. After all, aren’t we conditioned to believe that in order to lose weight we need to work out vigorously and eat miniscule, unappealing meals? We’re about to tackle that misconception at Yoga 4 Youth. Being overweight puts you at risk for many chronic diseases – diabetes, heart disease and hypertension to name a few. Regular yoga can help spur natural weight loss just as effectively as any high intensity exercise program. How can a 75 minute class of relaxation and breathing techniques achieve this, you ask? Yoga does more than just burn calories. It naturally encourages lifestyle changes towards a healthier diet and normalizes the functioning of glands and organs. Yoga helps to reduce stress and other psychological conditions that often lie at the heart of weight gain. In fact, yoga may be the permanent solution to weight loss that many are looking for because it addresses the issue of weight gain in a much deeper and holistic manner. 1. Waking up the organs – The average yoga class challenges your body by putting it through a wide variety of movements thereby increasing circulation and improving the functioning of internal organs such as the heart, lungs, kidneys and digestive system. 2. Muscles burn calories – Muscle tissue has a higher metabolic rate than fat tissue so people with more muscle mass burn calories more effectively. Vigorous types of yoga such as vinyasa or kripalu increase muscle strength over time. 3. Reducing stress – It is well documented that stress is a leading cause of weight gain. Yoga teaches that mental stress results from stagnant energy trapped in the body. Yoga breathing techniques, known as pranayama, help facilitate the flow of “prana” or “life force” throughout the body, promoting greater mental and emotional well-being. 4. Reconnecting mind and body – We were born with a natural weight-regulating mechanism. You see it in babies and young children who instinctively know when they’ve had enough to eat. Unfortunately, we lose touch with these signals over time. The result – overeating and weight gain. Yoga helps reawaken that connection between mind and body, helping you to notice that appetite regulating signal more easily. Additionally, regular practitioners of yoga report that over time they become very sensitive to not just how much they eat, but what they eat and gravitate to more natural, less refined foods. 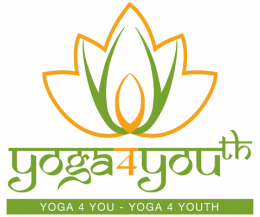 Yoga 4 Youth welcomes you to our home well being. Regardless of where you may be on your journey of wellness, our invigorating yoga classes will ably accompany you. There are few things more profoundly life changing for a woman than giving birth. It is one of the few times in her life when she reverts to her primal state, listening to her body as it guides her through one of nature’s amazing miracles. Birthing in all its natural glory should be a calm and beautiful experience for mother and baby. One of the key benefits of prenatal yoga is that it teaches moms-to-be how to breathe deeply and fully, allowing them to stay calm at the most critical points of the birthing process. In a scenario where the birthing mom is anxious, her body releases adrenalin, redirecting blood flow away from the uterus to the “fight and flight” mechanisms of the body. This can cause a tightening of the pelvic area, stalling the labour process and creating a vicious cycle of pain and anxiety. Deep and full breathing centres and relaxes the birthing mom so that her body can flow through the very natural process for which it was designed. Another fantastic benefit of prenatal yoga is that moms-to-be are taught specific poses that promote strength, balance and opening up of the pelvic area. As pregnancy progresses and a woman’s body changes, she may experience back pain. Prenatal yoga strengthens the muscles that support the weight of the growing uterus and help take pressure off the lower back. As moms near their due date, classes can focus on hip-opening poses that serve a dual purpose – they help get baby into position and keep the pelvic area open and unrestrictive during the first stage of labour to allow the baby to make the journey through the birth canal and into mom’s loving arms. Yoga 4 Youth warmly welcomes moms-to-be to our prenatal yoga classes on Mondays from 5.30pm to 6:45pm. We look forward to sharing this life changing journey with you. For more information please call (868) 678-1996.